Are you constantly fighting a battle against clutter around your home? If you live alone, then obviously you have no one to blame but yourself. 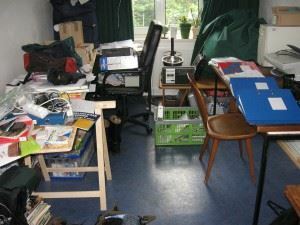 However, if you live with roommates or your family, then the waves of clutter never seem to end. Just when you picked everything up, folks return home and start dropping things like coats, shoes, backpacks and stuff all over the place. Those are all habits that can be broken especially if allowance is on the line! However, when it comes to bigger clutter items like unwanted furniture or appliances it’s time to get serious and bring in the pros from Junk King Fort Worth. One decluttering session with these junk haulers and you’ll set the tone for the rest of the year! Before the Junk King Fort Worth team arrives, you’ll have to decide exactly what you want to toss out. You don’t have to make that final determination until they do show up. You might have called in to schedule your appointment knowing that you just want a few items taken away but once you realize you got of work crew and a big truck that list can change. The fee for the job can only be arrived at after the crew is had a chance to size up all your stuff in person. They’re going to judge to see how much space it will take up on the back of the truck. This is a onetime fee that covers all the cost of the crew, the truck and the drop offs. It’s a very fair pricing policy. As for those drop offs, Junk King Fort Worth is determined to keep the environment around the city as green as possible. They accomplish this goal by avoiding the landfills at all costs. Instead, they’ll be dropping your junk off at a recycling center or charity. Yes, donating to a charity can also reduce your carbon footprint. You won’t even have to decide what things could be donated; just leave all of that to the Junk King Fort Worth crew. The only good clutter is no clutter. Put Junk King Fort Worth to the task of decluttering your home today. This entry was posted in Clear the Clutter and tagged clutter, Junk King, junk removal on December 27, 2016 by Cody Rodgers. Last updated August 8, 2017 .